Whenever I'm in Kaneohe, the only place I choose to eat is at Saigon! Located across the street from American Savings Bank and right next door to Dairyu Ramen and Curry. The Owner, Ken, is always super friendly and accommodating, and knows everyone that walks in the door. Saigon is very popular around that area, and most everyone are repeat customers. I can see why! Service, food, parking = excellent = MY kind of place! I always get their Oxtail Pho, and it never disappoints! Always consistent. Tender, not tough, oxtail and lots of it! More than you can eat Pho noodles hide underneath; finish with big basil leaves and a squeeze of lemon. Mmmm! Get their Summer Rolls and a Thai Iced Tea, and you've got a good, hearty meal right there. Lunch was almost $20! Buuuut, it was worth it. 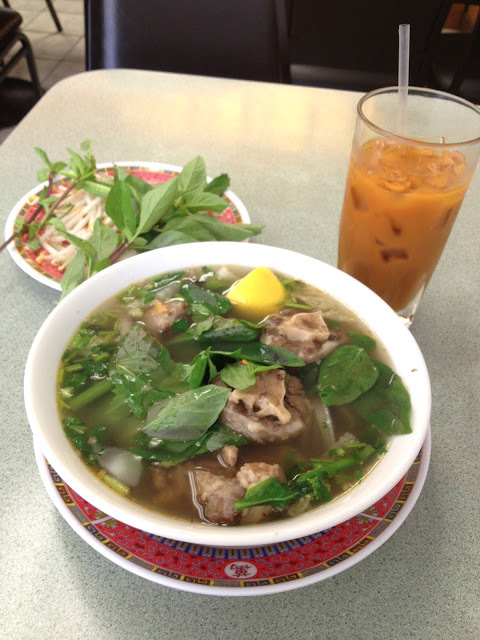 If you're craving Pho or Oxtail somewhere on the Windward side, this is my pick! Give it a go! The second time...and SO consistent.